Clerihews are four line poems in the form aabb, were the first two lines rhyme as do lines three and four. Furthermore, the first line of a Clerihew begins or ends with a person’s name and the poem focuses on some aspect of his or her life. Of course, there can be variations of this idea. As I explained in an earlier Post, Clerihews are named for their inventor, Edmund Clerihew Bentley (1875 -1956), an English journalist and writer. With his putting, most robust. One of the three would usually win. To beat pros who wear pants. If you are so inclined, try your hand at writing a golf Clerihew and leave it as a comment below. This book takes a close look at the earliest written records of golf in Scotland, from the 1457 Act of Parliament banning the game to the first ‘Rules’ of golf — the ‘Articles and Law’ of 1744 drawn up by the Company of Gentlemen Golfers for the competition for the Silver Cup played over Leith Links. Interestingly, some of these “written records” were recorded in verse. For example, Ms. Geddes devotes a chapter to a discussion of the first book entirely devoted to golf, called The Goff, first published in 1743. It was a mock-heroic epic poem, 358 lines long, written by an Edinburgh lawyer (who later became a Minister) named Thomas Mathison. A second edition was published in 1763 and a third 30 years later. In 1981 the United States Golf Association published facsimiles of all three editions under one cover in a limited edition of 1400 copies. One of few surviving third edition copes was sold for $80,500 in 1998. Till scarce the turgid globe contains its store. Ms. Geddes remarks that “Bobson” probably referred to a St. Andrews ball-maker named Robertson (likely an ancestor of Davie and Allen Robertson). The implication is that although balls were made in Leith at the time, the best balls came from St. Andrews. 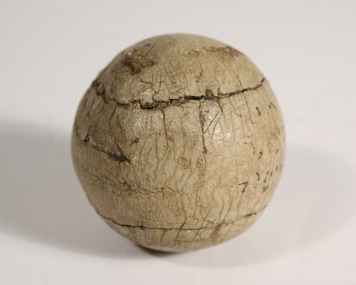 (Featherie balls dated back to 1618 and were only replaced by Gutta-Percha balls in 1848!) I hope that those of you who might be interested in golf’s early history will have the opportunity to consult A Swing Through Time. The question “What’s wrong with his/her golf swing?” is often answered today by looking at slow motion video. But the question goes back long before video analysis. It was raised with regard to Ted Ray’s swing shortly after he had participated in the famous 1913 U.S. Open won by Francis Ouimet. Ray comes to us with the reputation of swaying on his up-stroke. Ray does not sway—and we have observed him very closely. What he does is this: Just after the backswing starts the weight is transferred to the right leg; then, about half way up the swing the left shoulder is dropped more or less—a movement in contradistinction to, and offsetting, the first, but to the uninitiated eye, giving every appearance of a sway. The first puts the body weight where it properly belongs—back of the ball—the second enables the arms to complete the upswing. The bending of the knees, more especially the right one, outwardly, creates the false impression of a body sway. It is a sort of leaning in to the ball. Not “according to Hoyle” perhaps, but mighty effective—in Ray’s case. You do really, really sway. When at the 19th hole we pay. Ray was known for his portly build and prodigious length off the tee, though his ball often landed in awful lies. His recovery powers were said to be phenomenal and cartoonists usually caricatured him with a niblick in hand, festooned with clumps of heather and saplings, with an inseparable pipe clamped between his teeth. 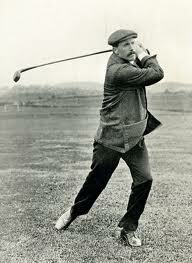 During his career he won the 1912 British Open and the 1920 U.S. Open. So, given this momentous week, Go Red Sox, and yes, Go Tiger. I hope they both look better this November than last. For here’s a cove who never heard of “Casey at the Bat”! But here’s a cove who never heard of “Casey at the Bat”! “Who is Casey?” Can you beat it? Can a thing like this be true? Is there one who’s missed the drama that ripped Mudville through and through? Of these famous lines by Thayer in the good old Thayer way? There’s one low and benighted fan who never heard the rest. But they know the somber drama from old Mudville’s haunted lot. He never heard of Casey! Am I dreaming? Is it true? Is fame but wind-blown ashes when the summer day is through? That bloomed in early morning, ere the dusk rides down the sky? Is there nothing left immortal in this somber vale called Earth? Is there nothing that’s enduring in its guarding shell of worth? And the things that we once cherished make their way to helengon? Where one forgets the drama of the Master and the Ash? Upon that day of tragedy beyond the trampling years? Rise, De Wolf Hopper, in your wrath, and cut the blighter down! For here’s a guy who never heard of “Casey at the Bat”!